Yet another with feet pointing slightly inwards. Am I missing something or have people forgotten how to stand properly? Please, someone, let me know. What a contrast to our Lady in Red! This witty costume would be perfect for the next episode of “A Series of Unfortunate Events”…I can see the effort here, and it’s a strain…even though I do love the vest. The shoes, sadly, smack of tourist–why not a pair of oxfords? She looks so very unhappy–I want to give her a hug and tell her to cheer up! I worry that this blog allows us to believe we can critique a person’s garb, simply because the subject has permitted Scott to photograph them. Is that what they’re aware of in the moment of the photograph? I just caught myself thinking, ‘Hmm, the woman has given an illusion she is long in body, short in legs.’ Then I thought, ‘You arrogant and self-righteous hypocrite!’ I don’t dress daily for an audience to give unsolicited opinions, do I?!! This is such a perfect shot! I like her look. She makes me think of P J Harvey. Is this the photographer from the Prince & Mercer video? Yes, it’s true, I am a sartorialist addict! Hilarious. Great sense of humor behind this. There’s something I like here, something real, but another part of me sees it as being a bit pretentious. Oh screw it, I like it, I like the morbid tone. I’d LOVE to see Karen and Jefferson walking down the street together – both so crisp with their slight smatterings of color. 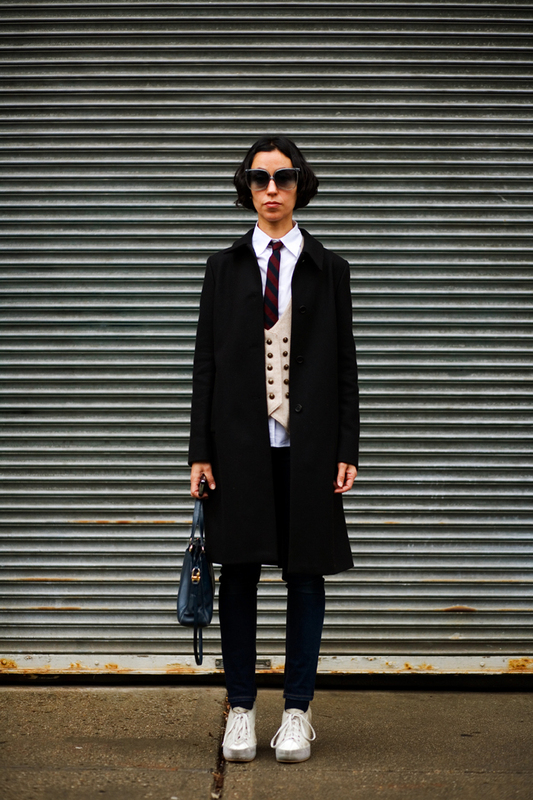 I like how she plays with the details: the school boyish tie, the diva sunglasses. That bag with those shoes. I believe she’s someone that chooses carefully her wardrobe in order to send a message. And again, the scenario is brilliant. Hmmm, this would have been a great ensemble until I saw the shoes. It cuts her off at the ankles and makes her look stumpy. I don’t really find this too appealing. She is almost a mask, wearing a costume, that hides her face and personality. Looks a little “Johnny Depp” from Willy Wonka….however, I love the vest. the backdrop you photographed her on, goes perfectly, its awesome gives a bit of sense to her look…. she reminds me of the matrix, that minimal background, with that outfit very cool…however i’m not crazy about the shoe pairing.. I love the outfit.Nice shades,shirt collar is perfect with the tie-and most of all i love that bold effect the waistcoat has on the jacket,my impression of her is charmingly foxy. Severe looking yet, great in her very own way! Very geeky, very chic-y. Love the aviators with the marching buttons and the sneaks. Willy Wonka lost his hat! Très cool! I just love this. It is so cool! The shirt, the tie, the vest, the coat teamed with jeans. I’m throwing in the towel as of right now, i could never top this woman. She looks like a young Karl Wallinger, but not as good. I don’t think the shoes and shades work with the rest of the outfit. Again, slightly inward pointing feet. What’s it all about? that is an amazing, arresting photo. your choice of background just emphasizes that stark quality of her style. Brilliant. Adore everything about the photo and her styling. Impeccable. She looks gorgeous but very unhappy. I hope it’s just a fashionable pose and not her true feelings. She looks like someone who has gotten everything she wants and now isn’t sure why she wanted it in the first place. Holy crap, this is one of my favorite outfits from this site. Those lines are so crisp! And how on earth did you make that perfect background happen sart?? Wow. This is really great. All of it. Her bored facial expression is perfect with the geeky chic-ness of this whole get-up. Love the vest!!! and the sunglasses..and hair…and coat. Reminds me a bit of Karl Lagerfeld’s manner of dress…only this is better, because of the androgyny. She’s daring and I think it works in that, as someone else put it, the long line is consistent. There’s a real conviction here. lines, lines, lines! I recently realized that I love photos with lots of lines, the most recent of which was the one with the staircase. What a character. Jeans fit (in every sense of the word) her perfectly. Very nice dress,How much it cost,i want one for me. Amazing glasses! And what about the white sneakers? I also see fabulous looks at the tents of Bryan Park every day. The show is also in the hall! she has a very ‘Karl’ look about her. Her style/outfit really suits that background…nice. A good picture always leaves some space for the viewer to fullfill. This one doesn´t. What she’s got, baby I want it. Including the nerve to wear shoes that are less than flattering. Looks like somebody from an old Hal Hartley movie. I’d bet that beneath the sombre facade of her expression and outfit lies a spirit of fun and a good sense of humour! That bit down the middle: the shocking white shirt, theh black tie, the cream-colored vest . . . all pointing to the white shoes. I love it. The hair! The sunglasses! The vest! The purse! I’d only improve on the shoes, but I can’t really knock someone for that as they may have been standing all day. the vest saves the outfit tho. I can’t get past the glasses. I hate them! and she needs a pair of heels! Other than that- its not bad..
GREAT SHOT!!! Love her style as well but it’s the pic that stands out here. Can’t get enough of the grey horizontal lines and the dark vertical line in the foreground. Would love to see other shots on this background. Very NYC! I wish I had the coat in red velvet. But I agree about the shoes making her legs look stumpy. They should be yummy oxblood leather. I like the background. She and the lady in black could get together and have an attitude show down. I’d bet on this one. Lovely although the shoes are at odds with the outfit, which I admit, may be completely intenetional and a statement in itself. It’s the boy/girl gender bender that is really driving this outfit for me. P.S. I love her shades. Anyone knows their provenance – please shout. her shoulders give so much to the look, perfect! How to be a handsome woman and manage to look bad. I have seen her at Schiller¨s many times. Always wears the same kind of outfit, even though it really fits her well , it seems that she wears the same same outfit everyday. Nothing new !!! oh my god, this is karen c the wonderfull fashion photographer! Double-breasted vest? Best part of the outfit. By the way, doesnt she remind you of some o those characters from Rocky Horror?